Second Acts: Heather Headley Is Back On Broadway — After A '15-Year Intermission' The actress, who won a Tony in 1997 for her role in Elton John and Tim Rice's Aida, returns to Broadway after 15 years, to play nightclub singer Shug Avery in a revival of The Color Purple. 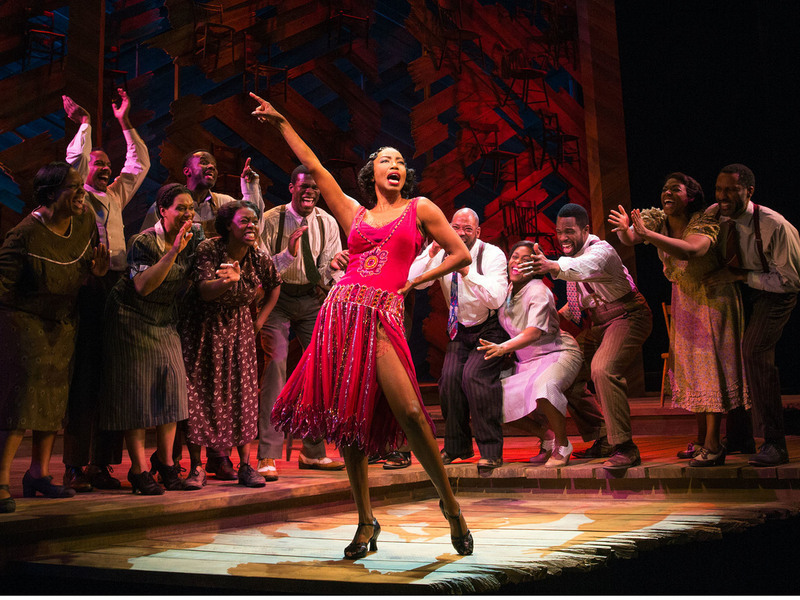 Singer and actress Heather Headley (center) returns to Broadway after 15 years to wow audiences in her role as Shug Avery in a revival of The Color Purple. Perhaps you've heard the famous F. Scott Fitzgerald quote that goes, "There are no second acts in American lives." Some may beg to disagree. After all, for many people, there are indeed second acts. One such example is singer and actress Heather Headley, who epitomizes this in ways few others do. Headley is a native of the twin-island republic Trinidad and Tobago in the South Caribbean, where she started singing and playing the piano in church at a very young age. She moved with her family to the United States in the early '90s. In the U.S., Headley continued to hone her skills in the arts and on leaving Northwestern University made a splash on Broadway, first as Nala in the original Lion King in 1997, then as the title character in the Elton John and Tim Rice musical Aida, for which — at just 26 years old — she won a Tony for best actress. And then she disappeared for 15 years. Well, sort of — she took a break to focus on music and family. But this summer, Headley is back on Broadway and wowing fans and critics anew in her role as nightclub singer Shug Avery in the revival of The Color Purple, where she replaced singer Jennifer Hudson. During what The New York Times describes as her "15-year intermission," Headley married fellow Northwestern alum Brian Musso, an investment adviser who played briefly for the New York Jets. They have two sons, John David, 6, and Jordan Chase, who turns 2 in August. Her focus on music and away from Broadway reaped success on the pop charts with her 2002 debut album on RCA Records, This Is Who I Am, which featured productions by several top-flight producers including the team of Jimmy Jam and Terry Lewis, as well as Shep Crawford. Two songs, the single "He Is" and the album track "I Wish I Wasn't," both emerged as top five rhythm and blues and dance chart hits. Singer and actress Heather Headley returns to Broadway after 15 years to play the role of Shug Avery in a revival of The Color Purple. Headley also featured heavily with classical singer Andrea Bocelli on his American and international tours, his Live in Tuscany PBS special and his Under the Desert Sky live concert DVD. And in 2010, she won her first Grammy award for best contemporary R&B gospel album for Audience of One. Now that she's returned to theater, Headley recently joined us in our New York City bureau, where she told NPR's Michel Martin about how it feels to be back on Broadway and more. Interview highlights contain web-only extended answers. On what it's like being back on Broadway after the "15-year intermission"
HH: I'm incredibly overwhelmed. It has been an extraordinary time; an extraordinary process, coming back in to the show and coming back here to New York. But very overwhelming for me. I think the Heather of 15 years ago — when you saw Aida -- she talks to me every now and then and says, "Remember this? Remember these streets? Remember walking here? Remember how you felt?" So I come back with a sense of gratitude, incredible gratitude. I come back with a sense of awe for what we do here in New York. ... I'm very humbled by it. It's been a beautiful journey to be back here. HH: No. And here's the deal, if I ever tell you that your show is not going to be a hit, it's going to be a big hit. That's just how it is. That was the case with The Lion King. When I got that audition to go in, I was actually understudying Audra McDonald. ... And they found a little hole in my contract and said, "Hey, we'd like you to come audition and it's The Lion King." And I remember seeing it and being like, "I don't know if this is going to work, I just don't know if this show is going to work." And here it is. It's just been such a great honor to be a part of it. You know when I got pregnant with my first son, I saw it and decided that I wouldn't see it again until I could see it through his eyes and at no point, Michel, was I ever concerned that I would not be able to take him, that the show would close, that he would not see it at his height and so a few months ago – he's 6 and half now — and I took him in to see it and he and I both sat there. We ended up crying. I think he was crying for different reasons. But I was bawling at the fact that here was thing that I did that it's still standing and that I could bring my own child to see it and that audiences are still being affected by it. So I'm incredibly honored, grateful to be a part of that show. Do you know my son did not recognize or even believe that was me? It hurt my heart. ... I was waiting for this day to show this child that I'm cooler than his father – I sang with Elmo, hello! I literally held this back from him for years, until the right moment and I put it in front of him one day and I said, "Do you know who that is?" And he's like "It's the pocket queen." And I'm like "Yeah, yeah, but do you know who that is?" And he's like, "Mom, it's the pocket queen." And then I was like, "It's me." And he's like, "No, it's somebody else's momma, not you." I don't even think that it was a discussion. I think it was like, "Here I am, I've fallen in love with this person and I want to give that time." And I did. And then the children. We got pregnant with my first son about six or seven years later. But I knew that I wanted to have time with him. And I feel as though, I as a person, as a woman, I want to be rounded in that way. I don't want to wake up in 15 or 20 years and look around and think that my children said, "You were never here." Or, even Michel, to not have had the experience of meeting my kids, to not have had the experience of mothering them and being there for them. It was necessary for me to maintain my craft and my art so that when I needed to come back at some point, even though it may have been harder to get back in the water, that I was still viable. ... I can't see not doing it. And I understand it's a very scary thing to be able to say, "I'm going to walk away for a second from this to have that." But I think I'm getting the best of both worlds. HH: Shug Avery found me. I was kind of sitting at home, I was very excited. I had a busy year last year, doing the tours, I did some shows. We had a baby; my second child is turning 2 in about three weeks. So it was kind of juggling all the things we just spoke about – mommy, and wife, and all this work ... singing and touring and stuff. I was kind of excited about maybe having a quieter kind of summer. So I was going to plant my pots and do this and do that and I was very excited about having tea parties. ... And then my agent called. ... "I need you to sit down." I'm like, "Uh oh," 'cause it means that he has something. 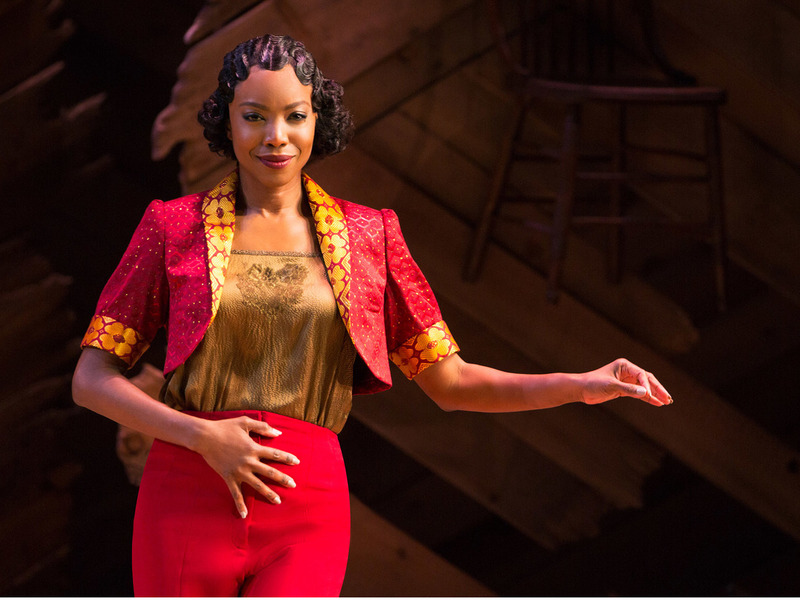 And so, Jennifer Hudson was leaving The Color Purple a week after the Tony nominations. And he had called and he said, "Look, they didn't want to ask, we know that replacing is not maybe something you normally do." But he says, "I think this might be something that you should be interested in." I flew into New York with my husband to see the show and found myself having the experience that our audiences - I see them having every night, just being overwhelmed. And looking around, my husband he's crying, and just understanding that theater is this really magical place that can take you to places that you just didn't remember that you could be taken to. So I kind of sat there and was like, "OK, if you need me to move a chair, I guess I'll be moving that chair, I'll be here." So that's how it was. I think Shug came and found me. HH: There's so much. I remember just seeing it and feeling this intense sadness for her. ... We all know these people. Sometimes they are us. We put up these facades, of maybe strength of who we are, but inside there's this incredibly broken person. And Shug is incredibly broken. She has not been loved the way she wants to love. My Shug wants to be loved, she wants to be married, she wants to be in a relationship and it starts off that she wants to be in a relationship with Mister. And he, even though he loves her has not done that. He's married everybody else but her. And one of the saddest things, one of the lines in the show is when Mister's father comes in and Shug is overhearing them talk about her. And he says that even Shug's father, who happens to be the minister in the community thinks that she's dirty, thinks that she's unclean and she's got a dirty woman's disease. And every night I allow myself to hear, cause I think that to me is the definition of her brokenness – that even her father has turned on her, for whatever reason, that community has turned on her. So Shug becomes real, obviously. But Shug becomes real to me because I know that there are many people in the audience, there are some women who will identify with Celie and then I want there to be women who identify with Shug, who've kind of reached out to men, reached out to maybe the wrong places to find their love. You know because they have been to some extent neglected by even that first man that should love them. Their dads, or whoever that is and then there's a way to find love. You have to find love in God, find love in community, find love in your sisters, find love in your friends. HH: It was a tough two weeks. ... And it was tough for the cast. Another part of this, Michel, is our show is very women-centered. And part of that is that we have to beat these men up. People have criticized – sometimes - Alice Walker, I mean her book, because the men get, they a bad brunt there. And that week it was tough to beat them up, it really was. It just kept going. Every time I thought my heart was broken enough, then Dallas happened. And then, Baton Rouge. It was just going and the only thing I know how to do is sing. I've been spoken to through songs; that's how I speak. I mean, if I could talk to you through song right now that would be easier. And that's how it was. And that song was just continually in my head. I just needed somebody bigger that I am. On what's next in her "Second Act(s)"
It's kind of like you have your mom's fried chicken or in my case, I'm from Trinidad, so your mother's curry, the curry from Trinidad. You get it from other people, you're just like, "Oh, that's great, oh yes, I had my curry and I have it from other places and it's really fine." And then you go home and you have your mother's curry or your mother's fried chicken and you're like, "There's no place like this." So that's how I feel, like I came home to my mother's home-cooking when I walked back on that stage. ... I'm excited about the next few years. In addition to a Tony and a Grammy, Headley's other accolades include the coveted Drama Desk Award for outstanding actress in a musical, voted as People magazine's "50 Most Beautiful People" and Essence magazine's "30 Women To Watch."